LOUDONVILLE, NY, May 26, 2008 -- Franciscan Father Louie Vitale will speak on the topic, “Love Your Enemies: Transforming Us-vs.-Them Thinking”, at 7 p.m. Tuesday, June 10, at Siena College’s Sarazen Student Union, Room 203/204. 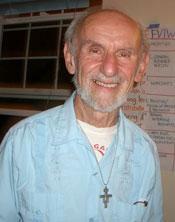 Father Vitale co-founded Pace e Bene Nonviolence Service and is currently on staff as the organization’s Nonviolent Action Advocate. Ordained in 1963, Father Vitale has devoted his life to peace, working tirelessly for the dignity and well-being of people everywhere. With a background in the Sociology of Religion and social movements, he is a long time social activist. He earned his Ph.D. in Sociology at the University of California, Los Angeles. A Franciscan priest who served as the provincial of the California Franciscan Friars from 1979 to 1988, he co-founded the Nevada Desert Experience and its movement to end nuclear testing. For 12 years he was pastor of St. Boniface Catholic Church in a low-income neighborhood in San Francisco, California. Suggested Donation is $10, but no one will be turned away due to inability to pay, according to Walt Chura, SFO. His appearance is sponsored by: Siena College; Peace Works; The Thomas Merton Society of the Capital Region; The Knights of Columbus of Saratoga Springs; Emmaus House, Albany Catholic Worker; The Secular Franciscan (Third) Order, St. Bernardine of Siena community, Albany; The Human Develop Committee, St. Bridget’s Church, Copake Falls.